Note. I’m not talking about Union Glashütte watches here. Search “union flieger” usually leads you to some flieger watch produced by Union Glashütte. 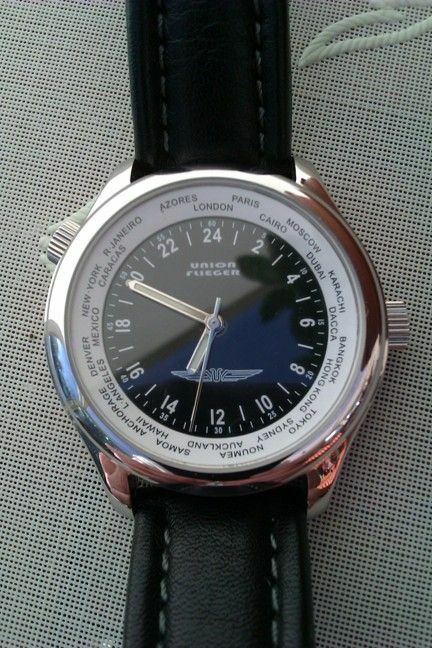 Here we have a small 24h brand called Union Flieger. In December 9, 2012, I was late as usual. 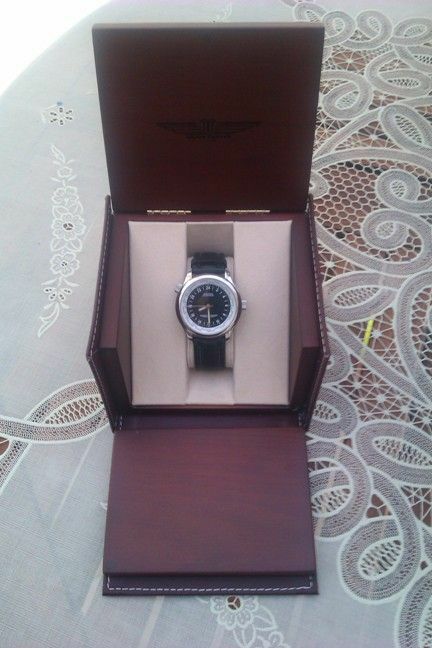 Suddenly I discovered in eBay, that some happy person bought in December 3 a 24h watch I never saw before – Union Flieger. Even in 24hourswatch.info is nothing about this brand. I wrote immediately to the seller, maybe he has some Fliegers more. He had one. The last one! To get this, maybe the last existing NOS Union Flieger, I paid $333. Again too much! After September 2008 only the 2431-based models were offered. In June 2009 all the Fliegers were sold out and until today there is the same message – “sold out, wait for re-release”. The last one I got, was leftover from series 2423/1. What a bummer – how can you pay $333 for a manual watch? 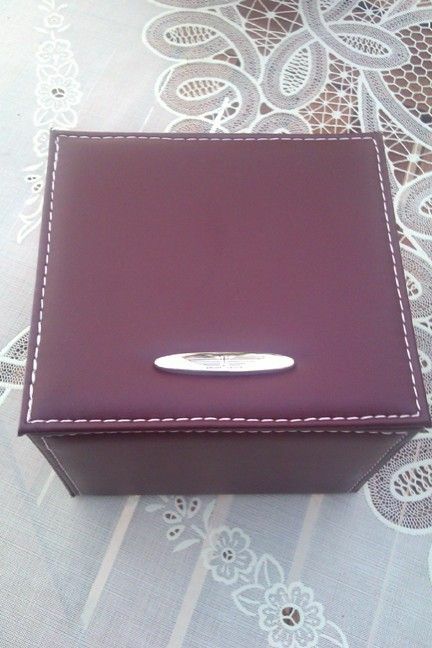 This watch came in a genuine leather and wooden box. To be honest, one of the nicest boxes I have. And fortunately not only the shell, but also the core is here OK and on the level. 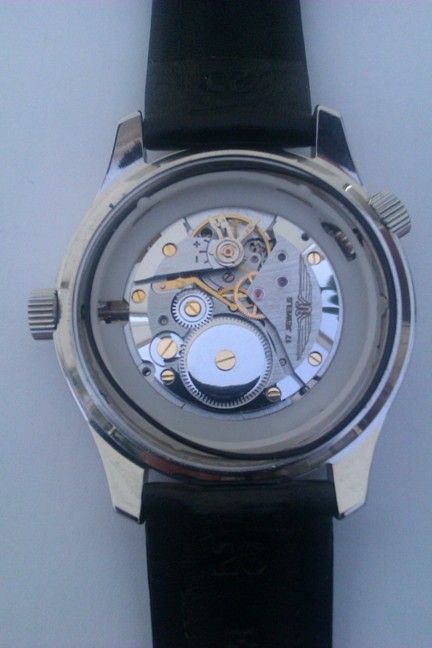 When you look at the movement, then it is not the common grey and inexpressive Vostok movement. Here we have nicely hand decorated 2423, glossy and with a yellow screws. On timing machine the results are OK too, as you can expect from Vostok. 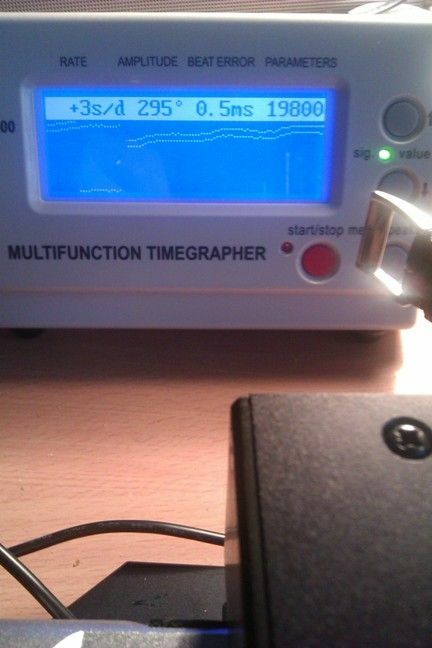 Here on the pictures you see, that dial up is +15 sec/day and the most common position, crown down, even +3 sec/day. I like the dial too. Very often the world timers have the cities in too small font and it’s useless for my eyes. Here the central dial, bezel, hands, everything is readable without problems. And as a result this is a watch I’m wearing quiet frequently. The caseback is transparent as it should be – the movement deserves it. On the edge is written “Union Flieger Limited European Edition 50/100”. On the glass is written “World Time 5 ATM Water Resistant All German Stainless Steel”. And on the glass you can also see the map of Europe. 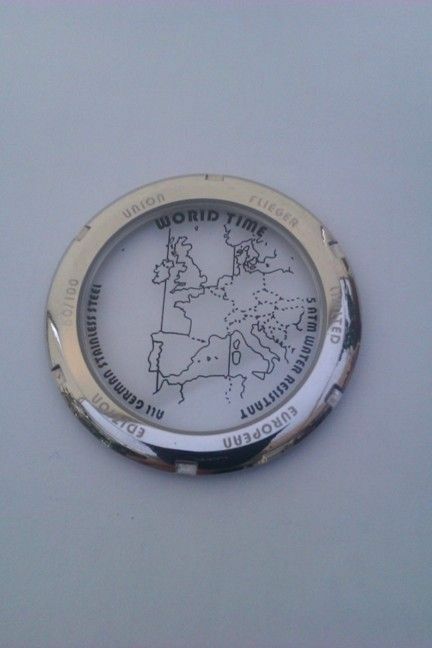 According to my research two models – 2431/2 and 2423/1 – had this “World Time” caseback. 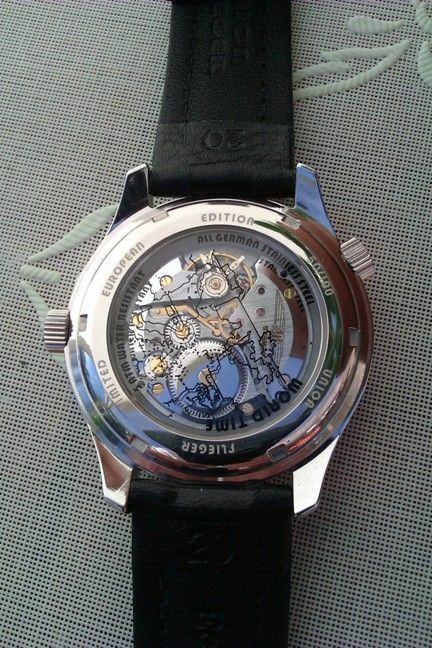 Other two had transparent caseback with text “Model Focke Wulf BMW 802” instead of “World Time”. And instead of map a plane. 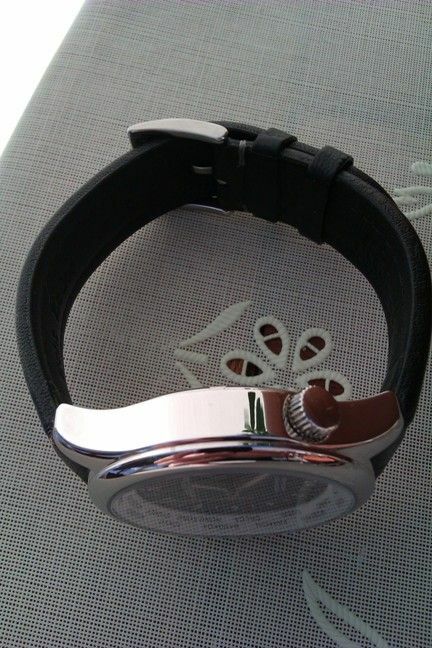 So I see, that here we have a good Russian movement in a good German all stainless steel case. It looks (and probably is) very reliable. If you can get for less than was my price, fine. The series was very limited and sold mostly in Spain and Portugal, I suppose. This one I have, and the other one sold week before, are the only Union Fliegers I ever saw on the market. $333? Poljot International is producing in Germany Basilika Polar Bear 24h watches for €500, with the same Vostok 2423 movement inside. It's a nice looking watch, I'll have to keep an eye out for one.. although near that price point I have some others that I'm after :) The movement looks nice, none of the vostok movements that have passed though my hands have ever been decorated. I remember that watch, and if i'm not wrong it dates even before 2007 (approximately around 2005). Some years ago, one of them popped on the German Ebay, with blurry pic and generic description. It went for a scandalously low price - approximately 1/10 of the "final piece" price. I still regret to not have bought it. 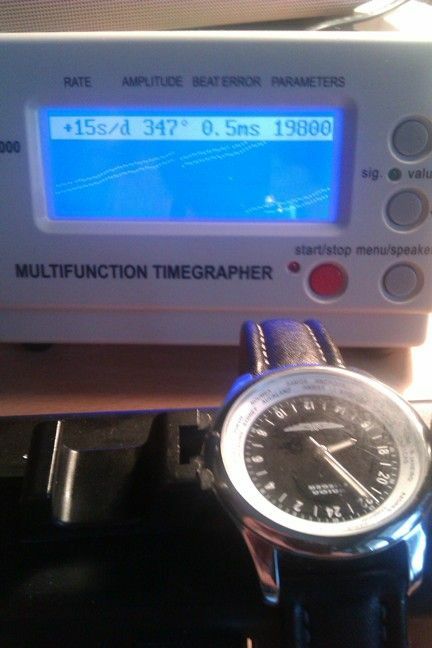 I think it's a very nice watch, since it uses the last "true" 24H movement made by Vostok. I have one of the last Vostok 24H watches (bought back in 2006) and i'm proud of it, but the chrome-plated case is not my cup of tea. The Union Flieger instead is very well finished - Russian heart, German finish. Nice piece. This was my weekly post number 4 (AWW 4). As all the attachments corrupted in WUS and there is no possibility to edit older posts I decided to repost the missing pictures. Union Flieger is a brand created by a Portuguese company called SRI - you can check their website at www.sri.pt and their Facebook page at https://www.facebook.com/Sociedade.d...a.Independente. They are the Portuguese distributors of Vostok Europe, PointTec (Junkers, etc...) and Aviator (Aviator, Sturmanskie, etc.). I know this because I'm Portuguese and I know the owner personally. I don't know if I can do this here (Mr . 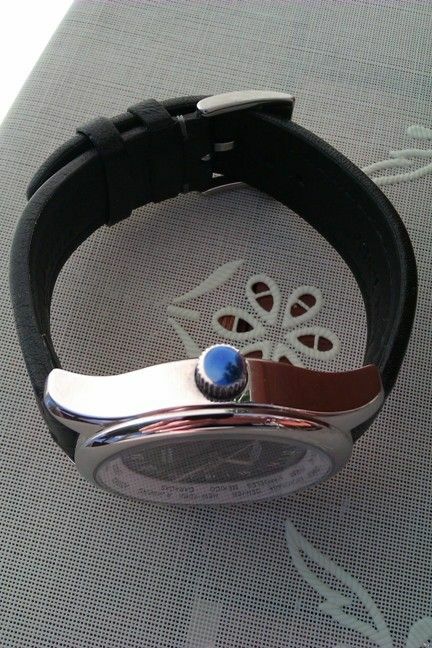 Administrator, please remove post if this is not apropriate), but I know that they still have some watches available, and that these are really the last ones, because they will not produce any more units. There is a gallery of the remaining 4 models here: Union Flieger - Galeria de imagens da AEMpress. In case someone is interested in buying directly from them, they can be contacted sending an email to [email protected]. I don't know if they send the watches by mail, but you can try and ask! Last edited by JorgeXavier; May 29th, 2013 at 18:50.